Learn authentic Thai cookery in your own home. Hi! I'm Nong Lawson. 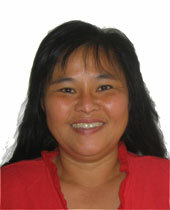 I'm from Chiang Rai in North Thailand, and I offer tailored Thai cookery lessons in your own home. They can be one-to-ones, or you can invite up to three friends (assuming your cooker has four rings!) and I'll teach you how to cook the most popular Thai dishes authentically. Or, instead of paying a fortune for inauthentic food at an over-priced “Thai” restaurant, why not have me over to help you prepare a dinner party at your house? Save a fortune and impress your friends! a sense of adventure and a hearty appetite—or invite a friend round at the end of the lesson to help you eat your masterpiece! It's also vital that you get freshest, best quality ingredients you can lay your hands on. Stuck for a gift idea for Christmas, a birthday, Mothers' Day or St Valentine's Day? Contact me and I'll email you a gift voucher valid for three months that you can put inside a greetings card. I'm in South Birmingham, so can travel to your house anywhere in the Solihull - Edgbaston - Sutton Coldfield triangle. I can come further, but charge more if I have to drive more than twenty minutes because of distance or time of day (starting at at £15). Each class is £40, in which you learn two dishes of your choice. (It's usually about 90 minutes). Double lessons (four dishes) are £75. I prefer to teach when the kids are at school; evenings and weekends are possible if I can find a babysitter (and cost more, to pay the babysitter). More information in the yellow sidebar on the contact page. Think of a combination of Chinese food, with its emphasis on rice and noodles, and quick stir-frying to seal in nutrients, and Indian food—but without the heavy, greasy feeling of Indian curry, and more spice than Chinese. Read more about Thai food.